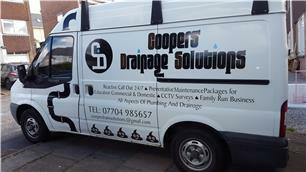 Cooper's Drainage Solutions - Drain/Sewer Clearance based in Plymouth, Devon. We are a family run business based in Plymouth and cover Devon and Cornwall. We offer a fast cost effective service for all your drainage problems. Are services include blocked drains and sinks, collapsed drains, burst water mains, drainage improvements and alterations. We have been checked and have worked for British Gas and several schools in the area. Give us a call and we will try to do all we can to help.